RBTH presents a selection of views from leading Russian media on international events, featuring news of a proposal by Russian President Vladimir Putin to send a delegation headed by Prime Minister Dmitry Medvedev to the U.S. for talks on Syria, as well as news that Russia is to send an observer to Antarctica and that Russians are allowed to purchase banned Western food products online. The Vzglyad newspaper writes that the Russian advance in Syria is being conducted simultaneously on two fronts: military and diplomatic. On Oct. 13 Russian President Vladimir Putin proposed sending a delegation headed by Prime Minister Dmitry Medvedev to Washington. U.S. President Barack Obama's reaction will show whether or not the United States is ready to talk about Syria. Moscow is not tired of reminding everyone that concerning Syria the main objective of helping its embattled leader Bashar al-Assad is to stabilize the Syrian government, something that will assist the so-called moderate opposition (that is, not Islamic State or Al Qaida) to negotiate with Damascus. Russia is offering the U.S. two things: coordination of military activity and motivating all openly non-extremist sides within the Syrian conflict to negotiate. "We offered a meeting at a high political-military level in Moscow. I also said that I am ready to send a big delegation to Washington for discussing, first and foremost, the issue of regulating the situation in Syria. But for now there has been no reply," Putin said on Oct. 13. According to Putin, Medvedev could head the delegation. The choice of Medvedev is clear: It was he who worked and met with Obama during his presidential term. Obama associates the much-vaunted "reset" of relations between Moscow and Washington with Medvedev, a treaty whose authorship was contested earlier by Biden and Clinton. 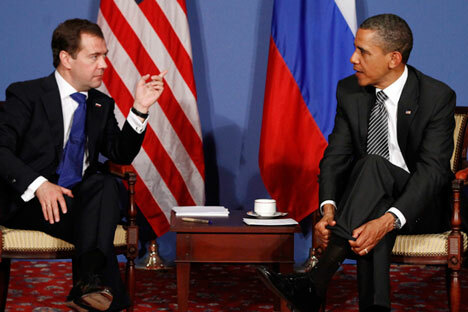 Now, the newspaper writes, on a psychological plane it will be easier for Obama if Medvedev is his interlocutor. The centrist broadsheet Izvestiya reportsthat a Russian observer to Antarctica is to be appointed to maintain order on the territory. The inspector will spend two months a year checking on Russian researchers, equipment transporters and tourism industry representatives, according to Russian Natural Resources and Environment Minister Sergei Donskoi. Donskoi said the ministry wanted to step up environmental control in Antarctica "in order to avoid any negative implications" to the environment from the presence of Russian tourists or cargo transporters in the region. "Control needs to be exercised from the beginning of cargo or tourist transportation until the end of all the procedures – everything must be under control. We are considering legislative amendments which will make it possible to control the entire process of transportation of products or people," said Donskoi. Anatoly Kapustin, president of the Russian Association of International Law, remarked that there is already a Canadian observer working in Antarctica, a plenipotentiary from the central government for respecting ecological norms. "In any event, all countries conduct mutual control, that is, see that the other countries are carrying out their responsibilities. There are more than 40 member-countries that signed the Antarctica Treaty, including Russia, the U.S. and Canada," he said. "According to the treaty, Antarctica must be studied only with peaceful aims: The global community must receive information on all the studies carried out on this territory," said Kapustin. The RBK business daily cites an announcement from the Federal Customs Service as saying that Russian consumers can order banned food products from the EU or the U.S. online. When Shopfans, a service that delivers goods to Russia from foreign online stores, asked for an explanation, an official from the Customs Service responded that Russia had banned the import of "separate types of food and agricultural products" from a series of countries, but the ban is not extended to goods imported for personal use. "Private individuals' use of goods ordered online, including those on the sanctions list, is possible but only if the goods are recognized as ‘goods for personal use’ according to Paragraph 1, Article 3 of the Agreement on the Movement of Goods for Personal Use by Private Individuals," explained the customs official. "Customs officials may have questions only if one person orders large quantities of the goods daily," said Petr Sharapov, development manager at Shopfans. Moreover, the weight of the imported goods for personal use cannot exceed five kilograms.